Congress House is a fully accessible building. There is no charge for attending this event. Woody Guthrie is best known as a political singer-songwriter and folk musician, whose musical and political legacies are enormous and inseparable. Guthrie travelled with migrant workers from Oklahoma to California and learned traditional folk and blues songs. Many of his songs are about his experiences in the Dust Bowl era during the Great Depression, and the hardship suffered by working people. Throughout his life Guthrie was associated with communist groups, though he was seemingly not a member of any. He was an active supporter of trade unionism and a trade union organiser. Guthrie frequently performed with the slogan “This Machine Kills Fascists” displayed on his guitar, and he became a committed anti-fascist. THE LONG ROAD TO PEEKSKILL presents the story of Woody Guthrie’s personal transformation from a young man in Oklahoma, who inherited racist beliefs from his father and other adults, to an ardent anti-racist champion. He, along with many others, risked his life holding the line against American fascism during the notorious Peekskill riots of 1949. Guthrie left an extensive body of songs condemning ‘Jim Crow’ segregation, lynching and race hatred. Most of these songs were never recorded, but they are the legacy of this remarkable journey that eventually brought Guthrie into the fellowship of Lead Belly, Josh White, Sonny Terry, Brownie McGhee and Paul Robeson. THE LONG ROAD TO PEEKSILL is both a harrowing and uplifting presentation, showing through the example of Woody Guthrie, that racists are not born, but made – and that they can be unmade. 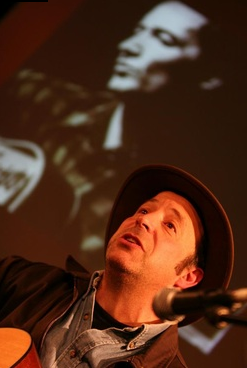 WILL KAUFMAN is a singer and multi-instrumentalist and has performed his tribute to Woody Guthrie at countless trades clubs, folk clubs, union halls and universities in Europe and the USA. His musical performances, set in a political context, are entertaining, educational and inspirational. Dr Kaufman is Professor of American Literature and Culture at the University of Central Lancashire, England. He has given his Woody Guthrie presentations at such major events as the Glastonbury Festival, the Bath International Music Festival, the Chester Literature Festival, the Big Session, the Whitby Folk Festival, the Piacenza Literature and Blues Festival in Italy and the Tolpuddle festival, as well as many performances in North America. Will is the author of the acclaimed Woody Guthrie, American Radical, published by the University of Illinois Press, in 2011. Copies are available from Bookmarks, which will have a stall at the event, or via Will’s website. This event is being held in the run-up to 21 March 2015, which is ‘UN Day for the Elimination of Racial Discrimination’, and the date of the Stand Up to Racism rally in Trafalgar Square, which is supported by the TUC. 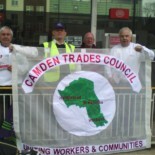 This entry was posted on January 22, 2015 by CAMDEN TRADES COUNCIL.